Train ticket. Reservation russians train ticket. Train tickets in Russia. Tickets can be purchased from train ticket offices directly at the train station or through a travel agency. 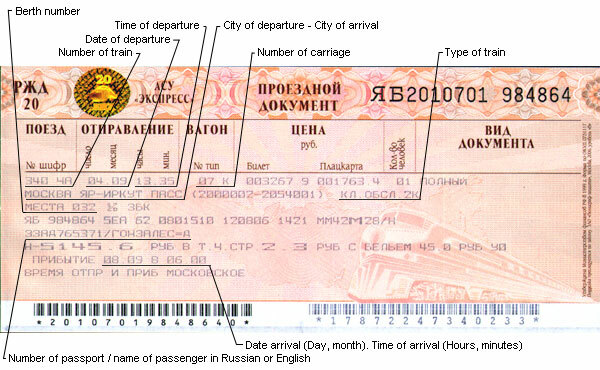 In Russia, it is impossible to reserve train tickets – passengers must always purchase their tickets first in order to secure their travel dates. The tickets go on sale 45 days before the actual train departure (40 days before the actual train departure in the international routes). There are also no open tickets for Russian trains - you will have to buy a ticket for a particular train on a certain date. In order to purchase tickets, you have to present your passport (passport copy or even just giving your passport number). There is no double pricing system for foreigners applied to rail tickets as there frequently is with theater tickets, so tickets are the same price whether you are Russian or not. In summer is the peak season for traveling and it’s better to organize your journey in advance. If you plan on traveling during these periods, it is important to book your tickets in advance, at least a few weeks but even better - over 1 month ahead of your desired departure date. Moreover, if you want to get the cheapest ticket possible then book even earlier, because prices tend to increase, when there is more demand for tickets. In June, for example, it is hard to get tickets in Moscow a week before you desired departure date. Your only option might be the most expensive ticket in the most extravagant VIP train, instead of having options for something more convenient that fit your personal needs and budget. On the most traveled destination routes like Moscow to St. Petersburg there are lots of trains, which travel back and forth, so it is always possible to get a ticket even on the same day as your desired departure date, but these tickets will probably be the most expensive options. Getting your ticket might also take some time unless you are willing to pay an extra fee by ordering tickets though a travel company. If not, you have to wait in line for at least a half an hour and have your money prepared, because it is impossible to reserve a spot - you must always actually buy the ticket and refunds are possible but you will lose a substantial part of the fare when you return your ticket. Lost or damaged tickets cannot be reissued, so be careful once you receive your ticket and keep it in a safe place.